THAT shiny, streamlined 1936 motor car that you bought for a few hundred dollars cost its manufacturer one million dollars! In all the story of modern industry there is no more arresting miracle than this. The million dollar car differs in only one respect from its moderate-priced brothers on the highwaysâ€”it is completely hand built. Into it goes genius of the highest order. It is the master model of skilled designers which serves as a pattern for mass production. Behind the creation of this hand-made car lies the fascinating romance of modern automobile design. 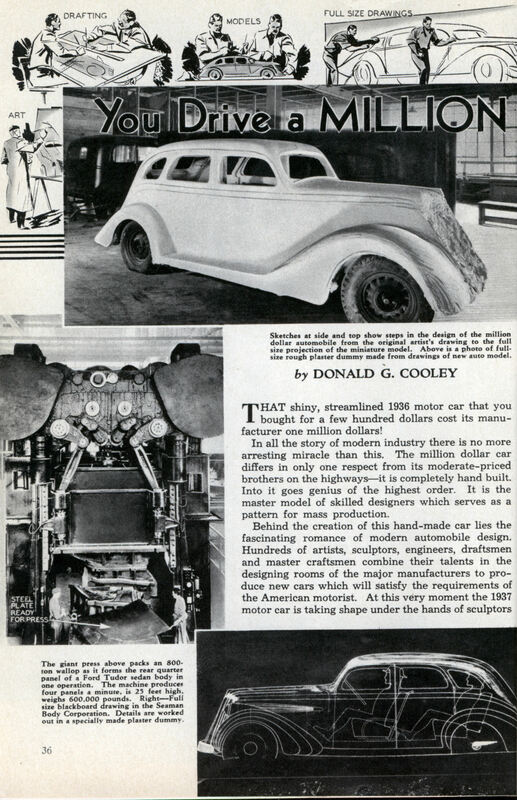 Hundreds of artists, sculptors, engineers, draftsmen and master craftsmen combine their talents in the designing rooms of the major manufacturers to produce new cars which will satisfy the requirements of the American motorist. At this very moment the 1937 motor car is taking shape under the hands of sculptors and mechanics. 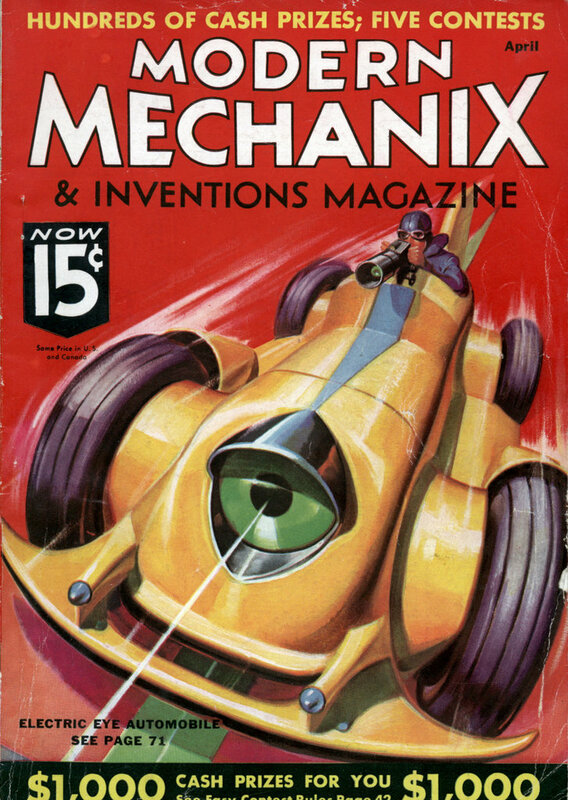 If the art of the sculptor seems far removed from that of the automobile engineer, it is because the average motorist is unaware of the revolution in design methods which followed the popularity of streamline models. In years gone by the motor car was born and reared to lusty manhood on the drawing board of the draftsman. It was a method inherited from carriage manufacturers, and it sufficed as long as the automobile was a more or less square body set on wheels. But today, although the drafting room is still indispensable, it is the artist who is supreme in matters of design. The actual design of a new car is no longer a series of drawings, but a life-size model of mahogany or plaster mounted on a chassis. No Greek sculptor ever lavished more loving care on the statue of a goddess than artists expend on the creation of a plaster car which will be reproduced thousands of times in a complex, living mechanism of steel, glass and rubber. The drafting room is still the birthplace of the motor car. Step into the design rooms of any automobile manufacturer and you will find hundreds of draftsmen working over long tables, and copying designs on huge blackboards large enough to take a full-scale automobile drawing. Thousands of pencil sketches are being madeâ€”drawings of fenders, radiators, louvers, hood lines. Thousands of them are discarded as the process of refinement goes on, but those which are most pleasing are projected full size upon the blackboards. These sketches are only the beginning. A drawing can show a streamlined curve only as a flat line. A mechanical drawing, for all practical purposes, must reduce three dimensions to two. As long as the automobile remained a vehicle of straight lines and flat radiator, the method was satisfactory. But today’s streamlined car is much more than a profile or a flat plan drawing. It is a creation of rounded, odd-shaped curves in which the vital highlights must flow unbroken from radiator cap to tail light. Only the sculptor and the model-maker can translate a drawing into a satisfactory picture of the car. When a design has reached the blackboard stage, the model-maker comes into his own. He makes a miniature model in clay, accurate to the finest detail. Awkward lines hidden in the drawing immediately become apparent. Refinements are madeâ€”a fender may be redesigned to blend into the body lines, the radiator lifted or lowered, the windshield tilted at just the proper angle. The miniatures, about one-fourth size, are studied in wind tunnels, a device borrowed from airplane engineers, and any obstructions in streamline form are removed. Now comes the task which calls for the very highest degree of artistic and mechanical genius â€”the making of a full-sized model. Everything depends upon itâ€”the success of the manufacturer in pleasing his customers, the jobs of thousands of men, the comfort and safety and even the life of the eventual owner. From this model will be made the dies which reproduce the car by the mass production methods which have made the American automobile industry a world-wide standard of efficiency. The line assembly system first developed by Henry Ford in the production of the Ford car has for years been used, with their own variations, by all the major motor car manufacturers. The model maker uses the blackboard drawing to follow the silhouette and principal flow lines, but little else. The draft is not a complete mechanical drawing, but a simplified full-size layout intended to make sure that the model will be built within specified limits of wheel-base and engine space. Curiously enough, the observer never really sees the lines of the streamlined automobile, but only the highlights reflected from its curved surfaces. Thanks to the modern absence of straight lines, the apparent silhouette of the car changes when viewed from different angles. For this reason the plaster dummy must be hand-shaped to the minutest fraction of an inch in order that the highlights may sweep in an unbroken line. High spots are carefully shaved down, low spots built up to eliminate the slightest distortion of highlights. Interior accommodations, the placing of seats, instruments, and gear levers is carefully checked in the dummy. When finally completed, the dummy is an exact replica of the car-to-be. It is not, however, from this model that the dies for production are made. For this purpose another dummy is built of wood, usually mahogany. It must be a faithful reproduction of the plaster model without a hair’s breadth deviation. This operation is perhaps the most critical of all, for both sides of the car must be exactly matched, and since the wood dummy is unpainted, the trained hand of the craftsman is the only assurance against wavy or broken highlights. A plaster cast is then taken of the wood dummyâ€”the same process used by sculptors in casting bronzes. The dummy is, on a huge scale, a pattern such as is used in a foundry. Divided into sections suited to the size of gigantic stamping presses, the plaster cast becomes a mold from which a steel casting is made. From this casting dies are shaped which will transform a flat piece of steel under tremendous pressure into a hood, a fender, or a unit of the body. The chassis and motor of the car have been undergoing refinements while the body is being designed. This cabalistic formula, incomprehensible to the layman, is but one of thousands which the knights of the slide rule had to make before your car could even begin to be manufactured. It represents the maximum stress allowable in a coiled spring of the type used in knee-action mechanisms. The work of the artist, vital though it is, must always remain subject to the engineer’s final approval. For an artistic car, even an efficient car, falls short of satisfying the demands of today’s driver. It must be safe. Watch how the designers conduct their unremitting search for safety. A car is wheeled into a darkened room in General Motors testing laboratories. It is being given a visibility test. In front of it is a curved white wall, marked off into thousands of inch-square divisions. Behind the car powerful lights are turned on, beating through the car windows and projecting shadows on the curved wall. A draftsman makes a copy of the area of visibility marked on the one-inch squares. Engineers pore over the chart, figuring methods of reducing the darkened areas and removing blind spots. Important to safety, too, is the location of a car’s center of gravity. If it is too high, the car rolls over easily. If too far to the rear, trouble develops in making turns at high speeds; if too far forward, steering is difficult. How can a car’s center of gravity be determined? Three hundred years ago Galileo sat in the Cathedral at Pisa, Italy, observed a chandelier swinging before the altar, and formulated the law of the pendulum. Engineers now apply it to make sure that the modern motor car will hug the road and control easily. Standing in the laboratory is a device which looks like a huge playground swing, suspended from a crossbar. A car is driven in and fastened in the swing. An engineer gives the swing a push and we see that it is in reality a huge pendulum. The time required to make a complete oscillation is recorded. It is then a simple matter to apply Galileo’s law to compute the distance of the pendulum pivot from the center of gravity of the car, and by deducting the height of the swing obtain the position of the center of gravity relative to the road. There is an added thrill in the ownership of a new motor car when the driver realizes that he is also part owner of pencil sketches which cost far more than a Rembrandt, and of clay and plaster models costlier than the Venus de Milo. He is literally the owner of a million-dollar car which no millionaire could improve.